This year's Chefs & Champagne recognized popular TV chef Emeril Lagasse as its distinct honoree, announced in the presence of A-list celebrity guests Richard Gere, Martha Stewart, Carey Lowell and Kelly Rutherford, among many others who were in attendance. Marcus Samuelsson was on hand to serve chilled corn soup with marinated bass and tomatillo-cilantro puree to the guests. He was excited to "see all his chef friends, and hang out and work" in such a beautiful setting. Chef Richard Grenamyer of Jacksonville's The Blue Fish Restaurant and Oyster Bar remained true to his style with a Asian-inspired seafood dish: soy and ginger glazed black & white sesame tuna. Zac Young, a contestant on season 1 of Top Chef: Just Desserts, prepared his twist on a lemon mereingue pie. He topped each slice with "disco blueberries," referencing the light dusting of edible sparkles. Each dish was paired with a Nicolas Feuillatte champagne from 2004, mostly in Blanc de Blanc, Rose, and Brut varieties. 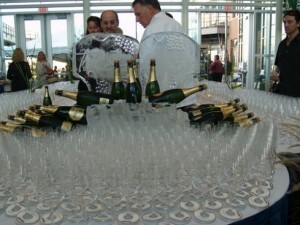 Guests with VIP access were served a glass of 1999 Palmes d'Or Brut.